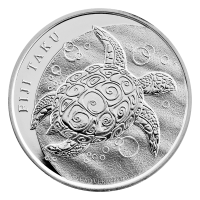 Purchase a 1 oz 2011 Fiji Taku silver coin at the best price online. We offer this silver coin with 999 purity worldwide, a perfect addition for any wildlife collection. This beautiful coin features the wonderful but endangered Taku, or more popularly known as the Hawksbill Turtle. This awe-inspiring , graceful creature is featured by Raphael Maklouf on the obverse side of this coin swimming elegantly in the waters of the Pacific Ocean. The reverse side features Ian Rank Broadley's profile of Queen Elizabeth II engraved in the middle of the coin and the words “Elizabeth II,” “Fiji,” and “Two Dollars”. Minted by the New Zealand Mint, this coin is a great way to add variety to your holdings. This item may arrive tarnished or in used condition. 1 oz 2011 Fiji Taku Silver Coin Purchase a 1 oz 2011 Fiji Taku silver coin at the best price online. We offer this silver coin with 999 purity worldwide, a perfect addition for any wildlife collection. This beautiful coin features the wonderful but endangered Taku, or more popularly known as the Hawksbill Turtle. This awe-inspiring , graceful creature is featured by Raphael Maklouf on the obverse side of this coin swimming elegantly in the waters of the Pacific Ocean. The reverse side features Ian Rank Broadley's profile of Queen Elizabeth II engraved in the middle of the coin and the words “Elizabeth II,” “Fiji,” and “Two Dollars”. Minted by the New Zealand Mint, this coin is a great way to add variety to your holdings.